I am on the phone every day of my life, most of us are. We send messages and receive messages and often we don’t think about the power of a well-thought-out message or a well-spoken reply to a message. I have been greatly disappointed by the quality of the phone messages I hear and the messages I receive. It is time to improve the way we communicate on the phone. I want you to make a great impression on the phone and I have some tips for helping you do that. I also started thinking about how much money agents lose with less than stellar phone communications. Let’s talk about some of my own pet peeves about doing business over the phone. Greetings that Don’t Communicate Professionalism. First, a pop quiz. What’s the best way to answer the phone? While we’re all answering #3, you would be shocked, stunned, and surprised to hear how some people answer the phone—with none of the above. How do YOU answer your telephone? Is your greeting welcoming? Does it let the caller immediately know they are dealing with a true professional? This allows the caller to know that they’ve reached the right company and the name of a helpful person who works there. What about when you make outgoing calls? When you call somebody and they answer the phone, how do you begin your request for what you want? This caller is not listening. We’ve already identified ourselves as The Lones Group in the greeting. This caller is not focusing on their telephone call. When you make a call, listen! 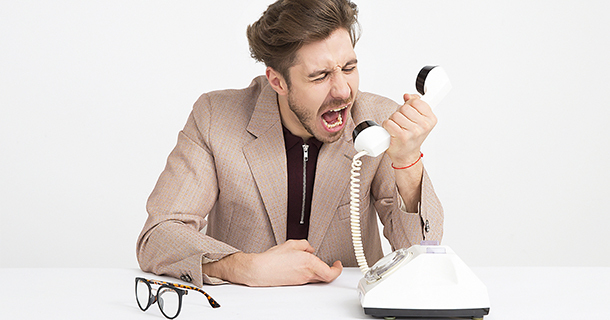 Constant fumbling when you’re on a telephone call drives people absolutely crazy. When you make a call, identify yourself! Note I do NOT just call and say, “Hi, is Mary Smith in?” The reason I don’t do this is because 99% of people are going to come right back and ask, “Who’s calling please?” You may as well answer the question before it’s asked and save time. Have you ever asked someone for a telephone number and they rattle it off so fast that you have to ask them a second time? Then, they do it again. You may even have to ask a third time. Please, please slow down when you’re on the phone. Not everyone can listen at the speed at which you speak. First, always leave a number. I may be on the road when I get the message and don’t have your telephone number. Have you listened to yourself lately? Pick up the phone right now and dial your voicemail. What do you hear? Is that professional? No. Is that the right image you want to create for your business? No. A message should be complete. You’re running a professional business, so your greeting should reflect that. It should tell them when you’re going to get back to them. If you’re off and can’t return their call until you’re back, they need to know that as well. That’s a complete message. It tells you that the message has been recently recorded. This communicates loud and clear that my business—and your call—is important to me. There’s nothing worse on the phone than a voice that subtly communicates boredom or annoyance. On the flipside, I can tell a lot about people from their voicemails—their energy, their confidence, their professionalism. I’ve literally hired people from the sound of their voicemail. If you have a blah voicemail, then you’re not going to impress me. Put some pep and energy in your voice. Smile when you speak. What she was referring to is the way I would always say, “Good morning Mary. This is Denise Lones.” I always said this with pep and energy in my voice, and I ALWAYS use their name before mine. And finally the NUMBER 1 mistake agents make with the phone. They DO NOT return phone calls in a timely manner. I could write a book on this one! Return your calls promptly. That’s how to be remembered. Starting today, pay closer attention to how you answer the phone, how you leave a message, the tone of your voice, and how you ask for people. Phone etiquette communicates who you are. It is the first impression people will get from you. Make it a good one.